The simplest way to remove a broken cork from a wine bottle. The CORKOUT was designed by sommeliers and is a must have for all wine lovers. Spot-Not decanter drier and polisher allows you to clean and polish the INSIDE of your decanter. Buy Both Spot-Nots And Save $5.00! Spot-Not Glass Drier and polisher easily gets in the hardest glasses. Save time, break fewer glasses. The Number is 1 rated Wine Preserver in the world. A must have for all wine lovers. The CorkOut™ kit is composed of 2 products. The Patented CorkOut™ tool and a corkscrew. The Corkout™ tool can be used on its own to remove smaller debris or in conjunction with the corkscrew for larger cork pieces. 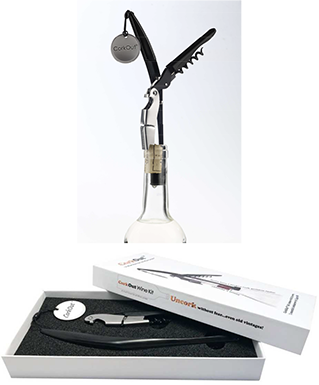 The corkscrew was exclusively redesigned to work with the CorkOut™. Please watch the above video to see how it works.